Greater is He who is in you . . .
Today, I was thinking about how many ministries teach on demonic beings and their names, and how to deal with them, but I have always felt that I don’t have time to worry about demons, except to cast them out. I want to keep learning about Jesus, and Him alone. Let’s keep our eyes upon Him, and let your Abba Father take care of the demons. For GREATER is He who is in you, than he who is in the world. Don’t give the enemy your time and attention (this causes fear) but lets keep following in Jesus’ footsteps. 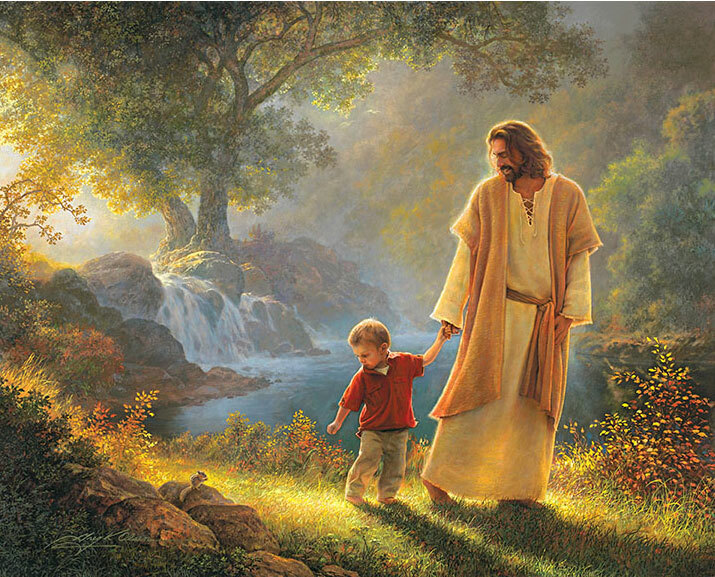 And then I had a vision of Jesus walking with His Child, and because He was so much bigger, He was walking a little ahead, but still close, just as a Daddy walks with his child and the child follows in His footsteps. The sun was shining brightly and there was Glory all around them. And Jesus was smiling as they went, and He kept looking behind to make sure His Child was right there with Him. And as they walked together, He was leaving beautifully wrapped gifts for His Child to find. They were having a GLORIOUS time. “Beloved. Every day, we are walking together. I AM always with you, My Child. You are walking on My Path. The enemy may look on from the sidelines and attempt to “huff and puff”at you and try to draw your attention away from Me, but do not fear, Little One. “You are with your Abba Father. I have you by the Hand and I will not let you go. You are walking with Me in the Sonshine. You are being changed from Glory to Glory into the image of your Savior. “Keep your eyes upon Me, Beloved. Learn of Me, for I AM gentle and humble in heart. We have places to go and things to see, Dear One. “For by grace you have been saved through faith; and that not of yourselves, it is the gift of God; not as a result of works, so that no one may boast,” Ephesians 2:8-9. “But to each one of us grace was given according to the measure of Christ’s gift. Therefore it says, “WHEN HE ASCENDED ON HIGH, HE LED CAPTIVE A HOST OF CAPTIVES, AND HE GAVE GIFTS TO MEN,”” Ephesians 4:7-8. “If you then, being evil, know how to give good gifts to your children, how much more will your heavenly Father give the Holy Spirit to those who ask Him?” Luke 11:13. “There are different kinds of gifts, but the same Spirit distributes them. There are different kinds of service, but the same LORD. There are different kinds of working, but in all of them and in everyone it is the same God at work. Now there are varieties of gifts, but the same Spirit. And there are varieties of ministries, and the same LORD. There are varieties of effects, but the same God who works all things in all persons,” 1 Corinthians 12:4-6.